This post will introduce the top 10 free online music downloader to everyone. Many people are wondering whether they can download music from the music sharing sites easily, but they don't know how to do that. Therefore, this post may provide a little help if you want to find the best free online music downloader. iMusic is one of the best media managing music for the iPhone, iPod and the iPad. 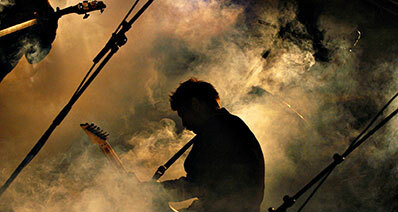 Download Online Music within seconds. Fast downloads and conversion speed. Supports tons of music and video sites. Easy music transfer between devices. Back up music library in your computer. Price: iMusic app costs $39.95 per year and $59.95 for lifetime access. Easy MP3 downloader is a helpful free online music downloader that lets you download music from very large databases to your computer. Easy MP3 downloader is easy to use, but if you want to get the full features of this downloader, you'll need to pay. 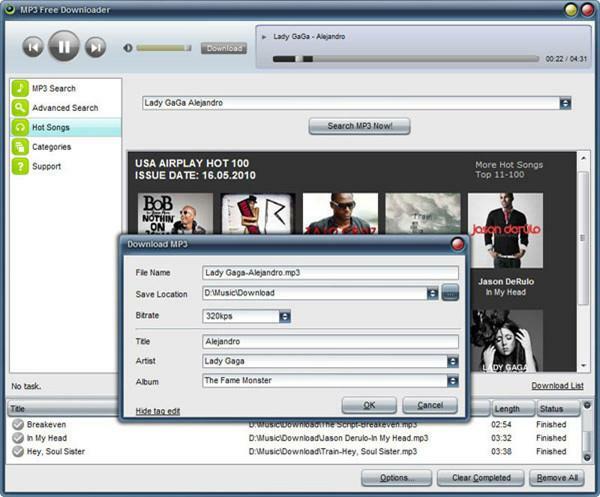 Large music database: Easy MP3 downloader has wide selection of music to download from. Easy interface: The user interface is simple and easy to understand. You can just search for a music title or album or artist name and you will plenty of lists to choose from. Virus free: Easy MP3 downloader is clean and safe from malwares and viruses. Legitimacy: You can't be sure whether the music is downloaded from a legitimate source or not. 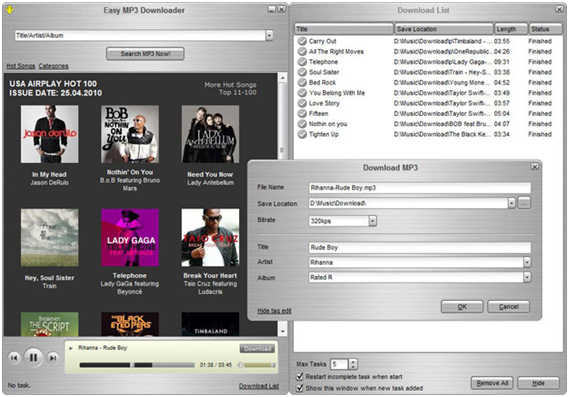 Price: Easy MP3 downloader costs $29.95. 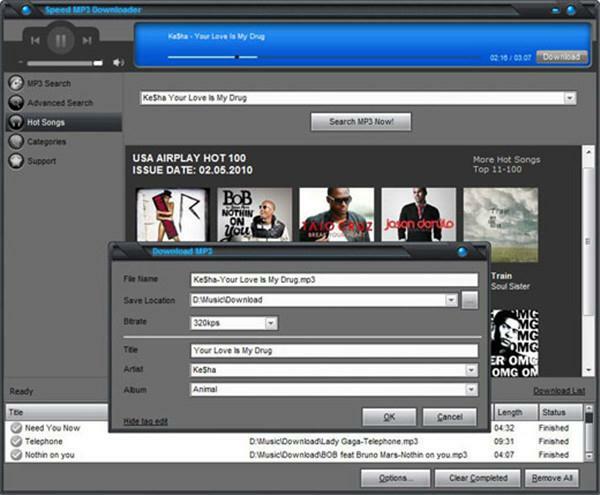 Songr is a another free online music downloader that allows you to search and download songs online in MP3 format. It allows music search by lyrics, and automatically converts search results to download links. Download immediately: Songr allows users to download music files from search results without going to any further page. Advance search engine: The search engine offers simple MP3 searching. 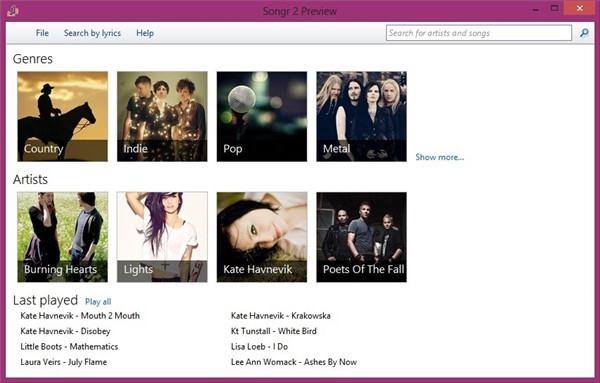 Users can search for music by lyrics, artist and album. No download resumption: Interrupted downloads cannot be resumed and users have to start the download over again. Price: Songr is totally free to use. 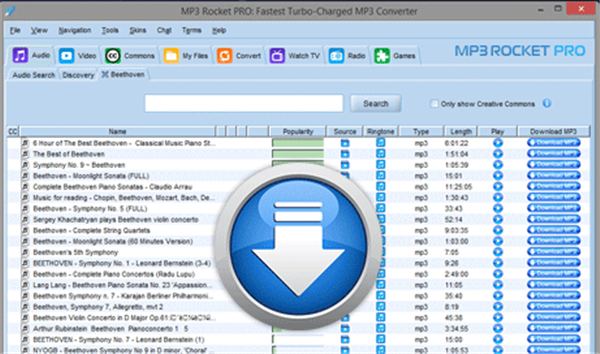 MP3 Rocket is a free online music downloader for the users to download videos to MP3 files. It has a standard version and a pro version, and the standard version provides several basic features which allow users to get the work done with ease. 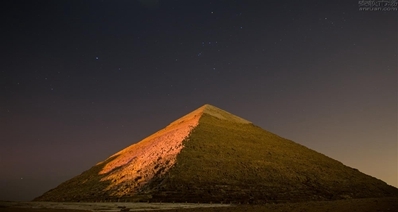 No registration required: With MP3 Rocket; no need to sign up before using the app. Fast conversion: The speed at which MP3 Rocket converts videos from YouTube to MP3 is very fast. Ringtones: MP3 Rocket converts downloaded music in to ringtones. Sound quality: Music downloaded is not of very high quality but not bad. Toolbar: The software installs unwanted toolbar to your browser even if you uncheck the option during installation. Price: MP3 Rocket is free. 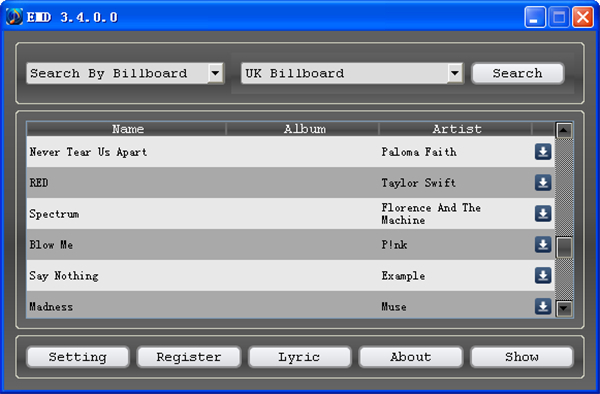 VCatcher is the free online music downloader for Windows and it supports all the popular Windows operating systems. The program helps you to capture and download any music or video from any website. Quick downloads and conversions: Vcatcher offers very fast download and conversion of videos. Automatically detects music and video streams. Screen Captures: It allows screen captures in videos. No full screen: The inbuilt video player doesn’t allow playing of videos in full screen. Limited trial: The trial has limited features and it is for 30 days only. Hot MP3 Downloader is one of the best free online music downloaders, and it allows users to download videos to MP3 within seconds. The program has a trial version so that you can have a try before purchasing it. 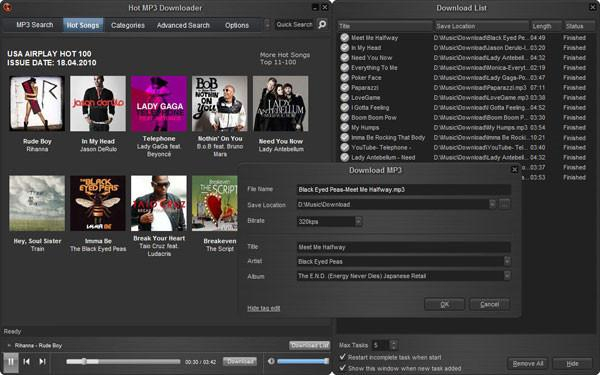 Large music database: Hot MP3 Downloader has more than 100 million music tracks available for download. Recommendation: It offers users with hot recommendations every week. Clean: Music downloaded with Hot MP3 Downloader is clean and virus free. Only 5 music tracks are free to download on the free trial version. Price: Hot MP3 Downloader costs $19.95. Speed MP3 Downloader is also a helpful free online music downloader. This program makes it possible for the users to download videos to MP3 files without any effort. Large music library: Speed MP3 Downloader gives you access to over 100 million music tracks. High quality: Music downloaded with this app is in high quality MP3 format. It has the largest collection of high quality music ever made available online. Clean files: Music tracks are clean and safe from viruses. Only 5 music tracks can be downloaded with free trial. Price: Speed MP3 Downloader costs $24.95. MP3 Free Downloader is a free online music downloader app for finding and downloading music online safely for free. Advance search: Music is easy to search for using title or artist name. Multiple downloads: The app supports multiple music download at the same time. Unlimited music: With the large music library, users have access to unlimited music. Some of the songs don't work. 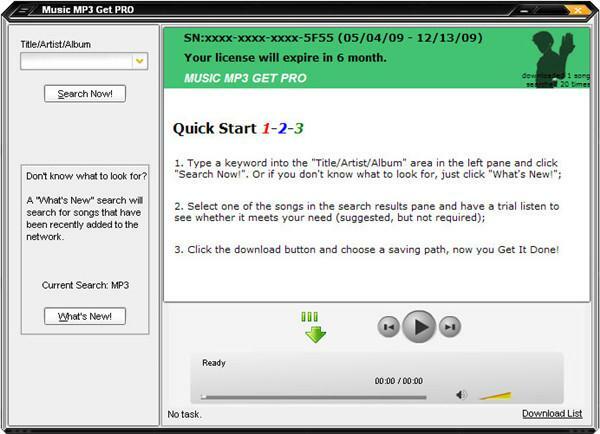 Price: MP3 Free Downloader is free but offers Pro version for $24.95. Easy Music Downloader is also a free online music downloader with a large music library that enables users to download music with ease. 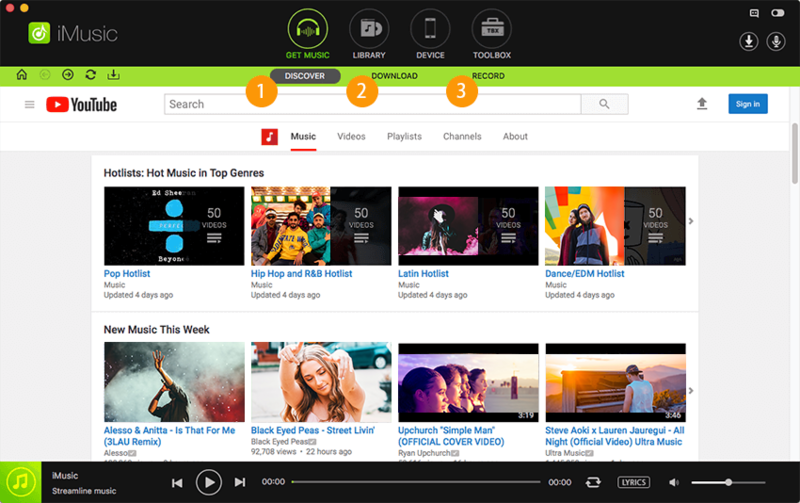 It gives access to over 100 million music tracks. It also supports different formats. Has a poor user interface. Mostly renders low quality music. 30 music tracks download for free trial. Price: Easy Music Downloader costs $19.95. This is a simplified free online music downloader which enables users to get music easily. The program will help users to get music easily. Music tracks can be previewed by using built-in music player. Price: Music MP3 Get is free but offers Pro features for $39.95.